An outdoor kitchen is an extension of your home. When looking at the true value of a home, the kitchen is one of the primary sources of value because it is generally your entertainment hub. Outdoor kitchens only add to this value and give you another place to enjoy your family and friends without leaving the comfort of your own home. Who knew that dining alfresco made food taste that much better?! 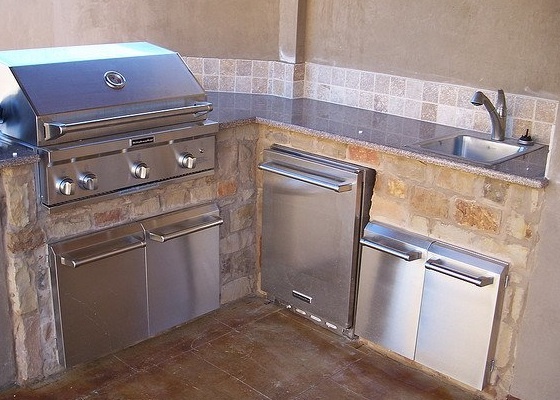 Each and every Varsity Pools Outdoor Kitchen that we build is customized and unique to the particular customer. We don’t utilize any kind of form or commercial mold. Every kitchen will be built with the customer’s vision in mind and intended to take advantage of the particular landscape that already exists. We pride ourselves in bringing you a wide pallet of material choices to build your backyard paradise. If granite is what you want, then the finest piece of hand selected granite is what you will get. If you are headed toward another type of natural stone or high quality material, we will utilize every last resource possible until the dream that you envision has become a true reality. Who would’ve thought about cooking a pizza in your own backyard? With an authentic wood burning oven, your pizza will never have tasted better. If you have questions about any potential outdoor appliances, Varsity will help guide you through the buying process and let you know where your hard earned money will be best spent. In addition to barbeque grills, we also install smokers, refrigerators, trash drawers, sinks, cocktail bars, drawers, drop in chests, ice makers, and more. We work with many popular brands including Viking, Capital, OCI, Green Egg, Fire Magic, Bull Grills, Urban Islands, and many more. And, in addition to appliances, the stainless steel storage units that we can add into your outdoor kitchen will be extremely valuable to store outdoor cookware or hide the necessary pantry-related ingredients from your guests. The goal is to make this a very functional and workable space yet present your friends and family with a picture perfect display of all the possible bells and whistles that an outdoor kitchen can provide. You don’t want to create a space that looks like a million bucks but never gets used. And, on the flip side, you don’t want to look only at the functional aspect and disregard the fact that the kitchen is actually a focal point of your entire patio. It must be both practical and beautiful! By allowing Varsity Pools & Patios to install a custom outdoor kitchen in your very own backyard, you are creating more room for entertaining your favorite guests and providing an environment that brings more charm than a standard dining experience. This space will be the perfect setting for big block parties or, alternatively, for intimate family gatherings. You will be the envy of all of your neighbors, and everyone will be beating down your door to get out back and enjoy your outdoor space. Give us a call today, and we’ll get started on bringing the ideal outdoor kitchen to your very own backyard!